Not a cloud was seen today, Friday, our final day of the COAST mission. Take-off was at 10:38 to be on station for an 11:00 start to a four-hour and 50 minute flight. All indications are that the AATS, Headwall, and C-AIR instruments functioned properly for all 18 flight lines, coincident with measurements from Terra-MODIS, MERIS, the RV John Martin on the bay and from a small set of ground calibration sites. Everyone on the team was smiling! Another complete set of flight lines were obtained on the 27th. Several technical issues caused us to scale back the plan for the day, but with all instruments running. We skipped spiral maneuvers and “painted the box” at a single altitude to get a good spatial resolution with the imaging spectrometer. Since we had only one satellite overpass (Aqua), it seemed fortuitous to delay a full-up science flight until Friday when the weather promised to continue excellent and both Terra and Envisat would pass over near noon. Four and a half hours of flying today. Impressive match-up between theplanned flight lines and the realized ones. Communications between theplane and the hangar worked well except for the last 20 minutes or so. 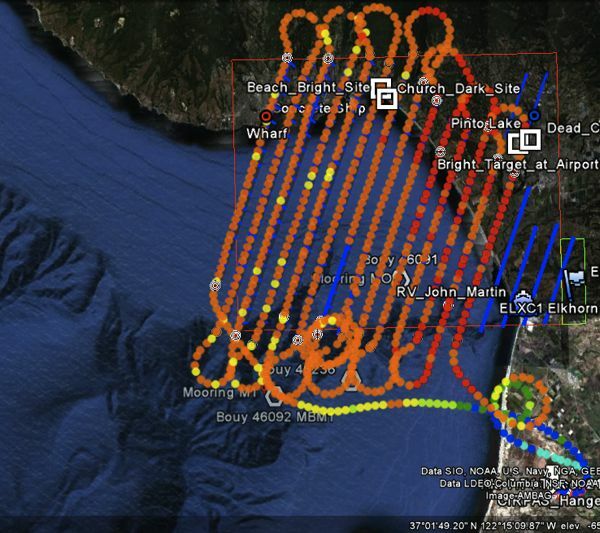 The image below shows the planned lines (solid blue horizontal lines)with the actual flight track represented as filled circles, coloredaccording to air temperature. Views like this (which we were able tosee in real time) especially gratified the PI and instrument scientistsbecause of the clear representation of the match-up and the spirals inthe flight pattern. All three instruments appeared to be operatingcorrectly. 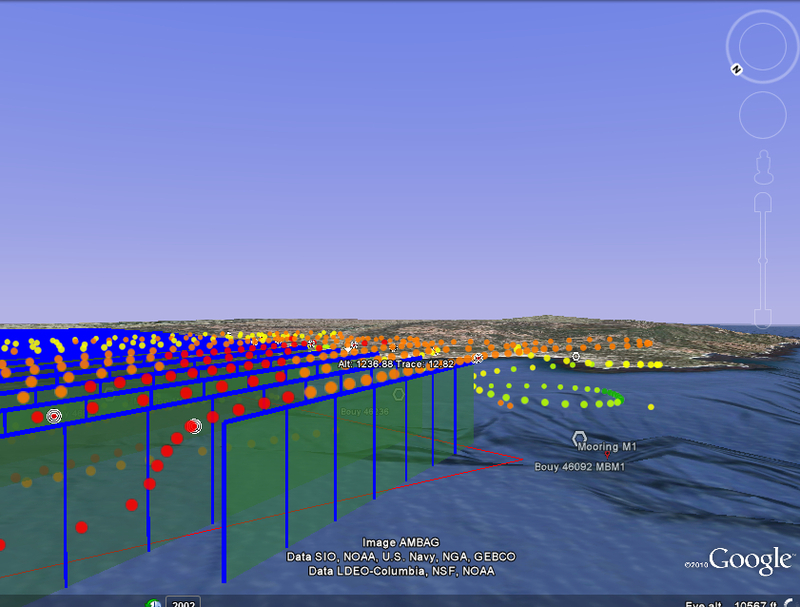 Thursday,October 20 had been on our project schedule since January as our target datefor the first COAST test flight. Thanks to the great folks at CIRPAS(http://www.cirpas.org), we started instrument integration last Friday, Oct14. All went well with installation and procedure review. The teamhas been here all week working hard for Thursday. 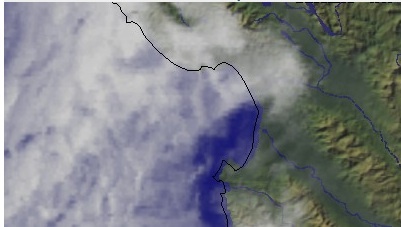 Thursday came and wentwith nothing but fog, but today we have been lucky and the fog cleared by12:30. After a quick mechanical test flight with no hitches, the firstflight test with our three instruments was underway by 2:15. Today the Twin Otter flew with our three instruments off to troubleshoot the issues we had on Saturday with satcomm between the aircraft and the hangar as well as dropouts that were occurring with the imaging spectrometer georeferencing system. Adjustments made to both systems mean they should work well during our next flight. Cirrus cloud that lingered til midday meant that a full-up science flight would not have been useful. Excellent flying weather is forecast for tomorrow and the plan is to have engines on by 10:30 am. Our first science flight is underway. The Twin Otter was over the first flight line at 11:10, in time for a MERIS overpass at 11:36 and a Terra overpass at 12:15. The photo here shows the plane with the radiometers in the fairing just above and behind the cockpit. The AATS is also visible behind the fairing, partially obscured by a propeller on the right. Welcome! NASA’s Ames Research Center, Moffett Field, Calif., performs so many different types of research that at times it can be mind-boggling. 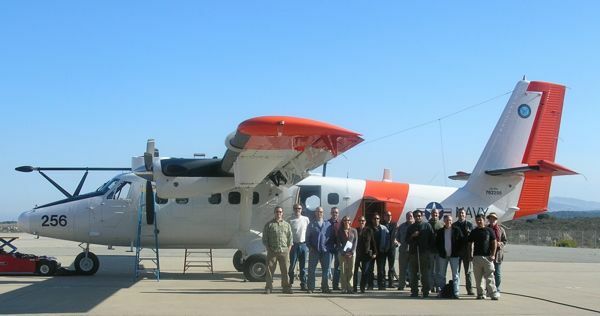 We conduct a wide variety of science missions and send our world renowned researchers and their collaborators all over the world to conduct science experiments, collect scientific samples, observe extreme lifeforms, capture revealing images of Earth and its oceans from aircraft, satellites and other science instruments and record scientific data. Researchers and their teams can spend months and even years preparing for these expeditions. They determine what is needed to accomplish their research during their limited time in the field. Included in the preparations are writing grants to fund the field expedition, building their science team, acquiring the necessary equipment and developing a schedule of activities and experiments. When they return to their laboratories at NASA Ames, the scientists conduct detailed analysis of what they have discovered, (which can take months and years in itself). Finally, the researchers write detailed reports to share their new discoveries and unexpected results with the world. This blog will provide an opportunity for our researchers and mission operators to record their experiences and lessons learned while conducting science experiments in the field. COAST: Successful second test flight! Great weather allowed for a full two-hour flight test in which the full flight plan (including spiral maneuvers) was run through. The pilot did an impressive job aligning with all planned lines. All instruments appeared to be working well. AATS tracking was problematic on aircraft turns — this was deduced to interference by an ADF (Automatic Direction Finder) antenna, which was not needed and removed. Satcomm communications between the hangar and the plane were unfortunately spotty. One fix for this will be tried before our next flight. Team choreagraphy for synchronizing all pre-flight procedures fell into place nicely today. Take-off was at 11:29. A red phytoplankton bloom, though not as extensive as last October, was readily visible from the plane. A whale (unknown sp.) was seen during the low altitude part of the flight as well as jellies floating and seabird flocks diving. The COAST instrument suite combines a customized imagingspectrometer, sunphotometer system, and new bio-optical radiometerinstruments to obtain ocean/coastal/atmosphere data simultaneously. Theimaging spectrometer is optimized in the blue region of the spectrum toemphasize remote sensing of marine and freshwater ecosystems.Simultaneous measurements for empirical characterization of theatmospheric column will be accomplished using the Ames Airborne TrackingSunphotometer (AATS-14). The radiometer system, designed and built by Biospherical Instruments, Inc., collects high quality radiance data from the ocean surface. Dr. Liane Guild of NASA Ames Biospheric Science Branch is the principal investigator.